Need a gift for your parents from your newborn? Or do you need a special "New Grandparent" gift for a friend or relative? 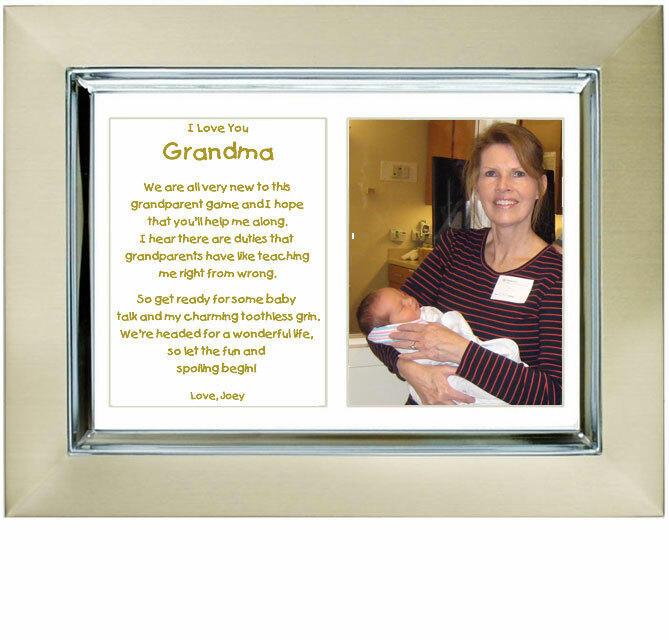 The new Grandma and/or Grandpa will just love to receive this lovely 5x7 inch picture frame with room for a photo of their new little grandson or granddaughter. The sweet poem written in a kids font from the grandbaby to his or her Nana, Papa, Granny, Gaga will surely touch the heart of any grandparent. Makes a very special personalized present for grandma or grandpa. Are you a new mom or dad? Do you want to congratulate your mom and dad on becoming grandparents? Or maybe a close friend, sister, or brother are new grandparents. 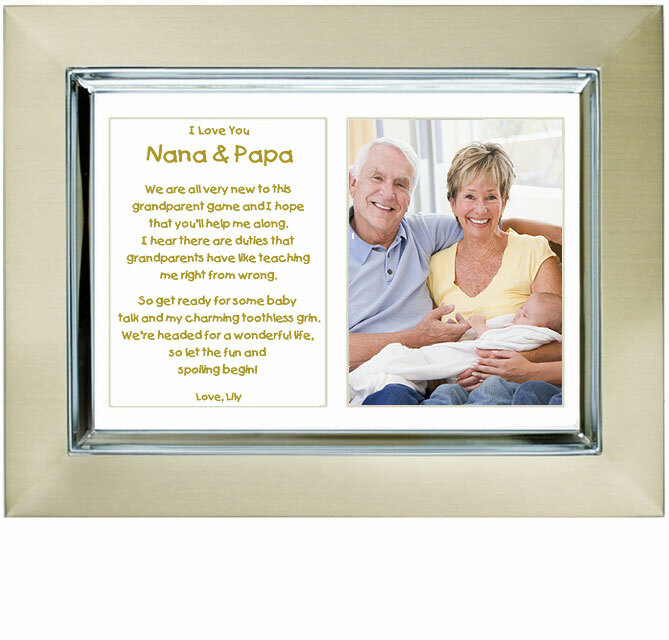 Welcome them to the very special "Grandparents Club" by giving them this lovely personalized "New Grandparent Poetry Gift." The outside dimensions of the gold and silver colored 5x7 inch metallic picture frame measure 7" x 9". There's room for the all important new grandchild photo in the 3" x 4" cut-out photo area. And what about that "Oh So Sweet" original poem from baby to grandma and grandpa! It will surely melt his or her heart. 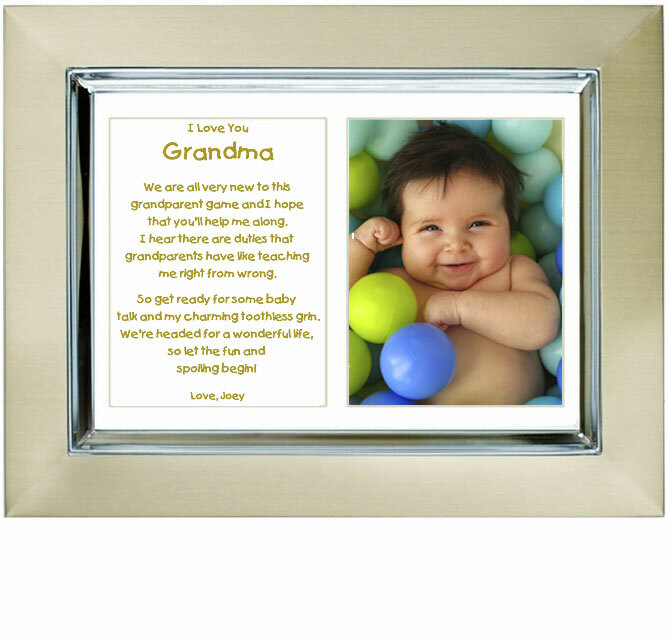 Frame comes with an easel back so this grandparent keepsake can be displayed on a table or dresser. Also makes a wonderful desk accessory for Nana and Papa. What a special personalized present for a new grandparent. that you’ll help me along. talk and my charming toothless grin. The photo opening is approximately 3" x 4". This size opening is perfect for a large wallet size photograph, but you can also display the most important part of a larger photo. If you do not want a photo area in your Poetry Gift, choose the No Photo Area option when placing your order. The photo opening is approximately 3" x 4". If you have a little larger photo you will be able to display the most important part of that photo. If you do not want a photo area in your Poetry Gift, choose the No Photo Area option when placing your order. If ordering this gift with a photo opening there is a white mat with a 3" x 4" cut-out photo area - photo can easily be inserted into the frame at any time after delivery. Needed a grandparent gift for Grandparent's Day. Ordered last minute and got it in time. Great service. Will order here again.